The Icom IC-F series of commercial HF SSB ALE Selcall radios can be used in Amateur Radio Service. Here, we provide some helpful guidelines, information, and fill files for various versions and feature sets to enable these radios to operate on the ham radio ALE HFN and HFL nets and channels, as well as various Ham and commercial Selcall channels. Please keep in mind, that this page is a work-in-progress, and any of the information or files here are beta versions, subject to changes or bugs. This is not an official Icom site. Not an endorsement by HFLINK of any radio. There were known bugs in the early firmware of first Icom IC-F series HF radios, but recent F8101 firmware "enhanced" upgrades solved the problems. There is no guarantee of any kind that this information is appropriate for the user or for any specific radio model or version. The information here is provided for informal educational reference purposes only. We highly recommend that you seek professional technical service for programming your radio if you are unfamiliar with the complex firmware, software, hardware, and interfacing issues involved. Generally speaking, it is complicated (but possible) to set up an Icom commercial HF radio for ALE and Selcall via the front panel by hand jamming (keypad programming) the channels and parameters into it via the keypad. Keypad programming is only recommended if a very simple configuration is required. We recommend reading the Instruction Manual and following it carefully. It would probably take 12 hours or more to program a full-featured ALE/Selcall complex configuration by hand... and when finished, it would be very difficult to debug any problems with it. The information we provide here about software programming can be used to program the radio via the keypad, or to change a few of the parameters or channels on the fly. The settings can be seen by opening the appropriate *.icf in CS programming software or viewing the *.pdf files on this page.. The Icom IC-F7000, IC-F8100, and IC-F8101 radios are designed to be programmed by a radio technician using a computer, before the radio is put into commercial or NGO service. Icom radios are available in a variety of software-defined feature sets that are loaded into firmware by the radio technician. Two radios may appear the same on the outside, but the firmware inside them is what determines how they will function, and that may be entirely different for each radio. 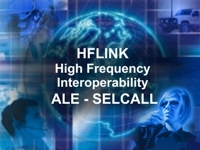 By using the Guidelines and fill files provided here on HFLINK... the channels, the Selcall, the ALE features, and complete set up of the radio for ham use can be easily programmed by a computer-savvy ham radio operator. Keep in mind that the HFLINK fill files are designed to enable the ham operator to use all the normally-obscured features of the radio. The focus of the design of the fill files is to provide a wide variety of functional value when the radio is used by a ham operator for EMCOMM service. This means that hundreds of frequencies for ham radio service, emergency use, other services, and disaster communications are loaded in memory that might not be needed on a daily basis... but may be accessed when needed in an emergency situation. The ham radio oriented HFLINK fill files are not suitable for radios intended for commercial HF or NGO applications. However, these fill files may form a foundation or example that can be modified by a radio technician for other purposes. For knowledgeable users or techs intending to modify the fill file or create a new fill file for the radio, it is extremely important to gain a very thorough understanding of the interaction, limitations, and functions in the programming available, before ever starting to program it. We recommend the use of a serial port or USB interface cable with a PC or laptop computer using the appropriate CS-F7000, CS-F8100, or CS-F8101 cloning software. The software configures the Channels, Networks, Profiles, ALE IDs and nets, Selcall IDs, and Setmode programming. The fill files with file extensions *.icf are necessary for programming Icoms for ALE and Selcall using the Icom CS Cloning Software. The *.icf file should be loaded after the CS software and the radio transceiver are set up and connected together via the proper USB or serial port connection. A zip file is available here for download, it includes all regional versions of the various files in one download. Please note: These fill files are set up for use in various countries of the world, so there are many channels that are selectively enabled via Network and other configuration, depending upon the region *.icf file the user decides to load. Australia HF 4WD networks: VKS737 HF Radio Network / HF-Tel, Austravel VMD750, HF Radio Network VKE237, Radtel, HFoZ, Reids Radio Data / Bush Telegraph / Bush Phone Plus VMS469, RFDS Network, etc. 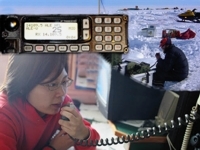 New Zealand Emcomm, HF 4WD, tramping networks such as: NZ AREC, NZ MRS, etc. 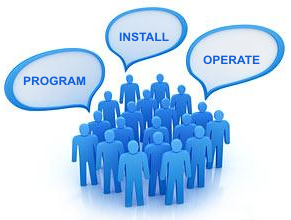 The programming can be edited for other applications, countries, or purposes. When using these files, it will over-write the channels and ALE programming in your radio with the new file channels and settings. Save your existing programming before loading the new file. Important: To use these files, you must follow the Guidelines below carefully. Do not skip any steps, otherwise the configuration will fail. Beta version for International, Europe, Canada, USA, Australia, New Zealand, South Africa. Primarily designed for Ham Radio use, but also includes other services.
! WARNING ! Do Not Program IC-F8100 with IC-F8101 Software or Fill Files. 1. Connect computer to radio using a USB A programming cable less than 3 feet (1 meter) in length. Use a USB 2.0 port on your computer, or else use a USB 2.0 hub between your computer and the radio. Not following this recommendation on USB hardware can cause your computer to fail to properly communicate with the radio. 2. Connect a dummy load to the radio. 4. Start CS-F8101 software and set up the software COMM port by using the automatic Search TR, or manually setting the port. 5. 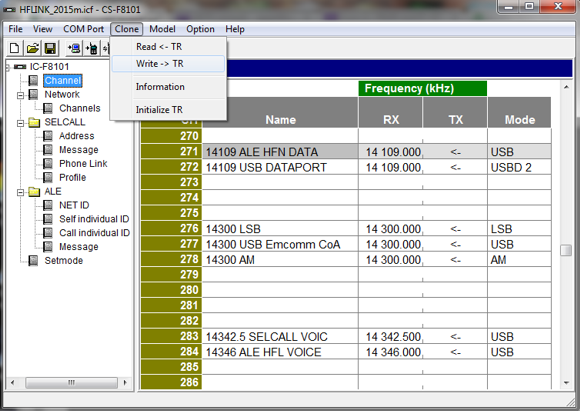 In the CS-F8101 top menu "Clone>Read<-TR"
Wait for the software to load from the radio. 6. In the CS-F8101 top menu "File>Save As"
7. In the CS-F8101 top menu "File>Open"
Navigate to the the file you want to load for your country/region/area. 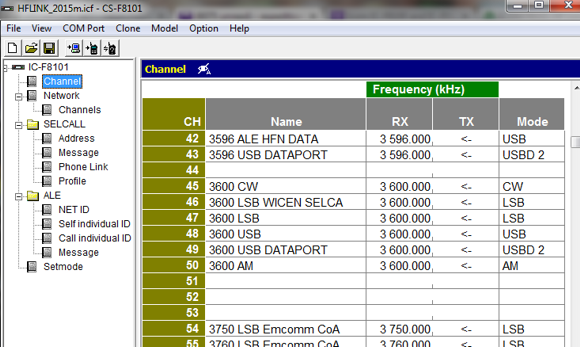 In the CS-F8101 menu "IC-F8101>Channel"
8. In the CS-F8101 programming menu section "IC-F8101>SELCALL>Profile"
Change the SELF SELCALL ID from 3001 to your own selcall address. Change all the 4 digit numbers for each of the Selcall Networks listed in the profile. Normally you would enter the same selcall number for all 4 networks in each of the lines of ID. If you have a different selcall number that you use for VKS737, for example, you can enter it in the ID for that Network. If you need a ham selcall number, please post a message on the HFLINK group, and your number will be added to the Selcall Coordination Listing for Amateur Radio. 9. In the CS-F8101 programming menu "IC-F8101>ALE>ALE-Self Individual ID"
Note: do not use " / " in your ALE callsign. 10. In the CS-F8101 top menu "File>Save As"
11. In the CS-F8101 top menu "Clone>Write->TR"
Wait for the file to be loaded into the radio. Check through the channels, to see that they have been loaded into the radio properly. 13. Test the scanning and calling of ALE and Selcall functions. Avoid changing the order of existing channels. Instead, add a new channel in a blank space or else replace an undesired channel with a new one, and then set up the network field configuration for it. Always begin the name of the channel with the frequency in kilohertz or else a sequential number in the order that it should appear in the front panel display. Always insert the channel in the list in order of either frequency or sequential number in the channel name. Remember to check the Network>Channels configuration for each channel after making any changes, since this can be corrupted due to additions, deletions or re-ordering. Hold down for 1 second for Network selection. Press and select Network to call on. Press and select Call Type = Individual. Press to select the Callsign to call. Press to select your Own Callsign. The next step, you have 2 choices. Press to transmit the ALE Individual Call. The radio transmits the ALE call now. If you need to stop the calling sequence, press microphone [PTT] to cancel it. Free software designed for HF Fleet Management by Icom for use with IC-F8101 radios. This utilizes the Selcall GPS Call system. Works with Enhanced Version IC-F8101 radios made after November 2015. 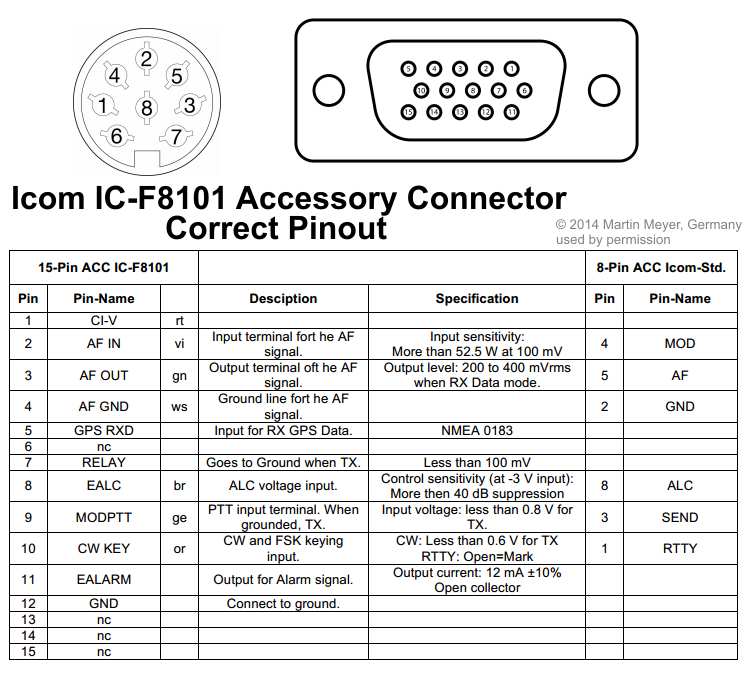 Errors were found in the IC-F8101 accessory connector pinout documentation in the manual. Please see the diagram below for the correct pinout. Thanks to Martin KB2CQI for testing and making the corrected diagram. ©2017 HFLINK. All Rights Reserved. 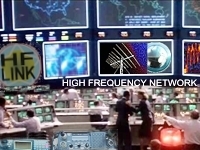 HFN and High Frequency Network are service marks and trademarks of HFpack, Inc. HFLINK is a division of HFpack, Inc. No part of the HFLINK website or HFLINK Group Forum may be used or copied without written permission of HFpack Inc.
HF Interoperability is Automatic Link Establishment techniques. HFLINK is the international resource for ALE Automatic Link Establishment High Frequency Communications, HF Digital Messaging, Emergency / Disaster Relief, Interoperative HF Communications, HF Network, Ham Radio.